Let Your Site Visitors Build & Visualize Their Bath With a Few Simple Mouse Clicks! Welcome to KBF designer. 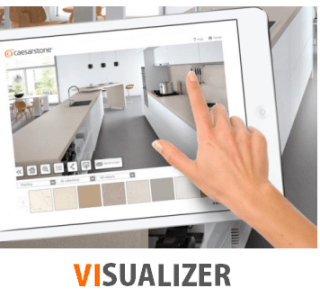 The best source for kitchen & bath visualizers. Bring complex kitchen and bath remodeling projects to life right before your customer’s eyes – and inspire engagement and purchase action. Let us add these amazing 3D Visualizer tools to your website and convert site visitors to customers, for a small fee. Sometimes, your customers just have to see it to believe it. This amazing 3D Kitchen Visualizer lets you do just that. See Demo. A unique Bath Remodeling Visualizer that lets your website visitors build their dream bath quickly. See Demo. 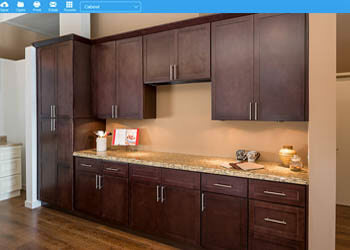 A fun and easy way for your customers to design the ideal kitchen cabinets right on your website with a few clicks. See Demo. 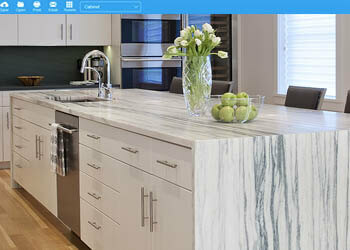 Show your customers over 100 patterns of Quartz, Granite, or Marbles countertops right from your website. See Demo. 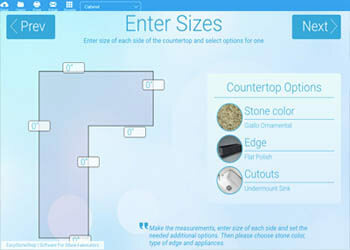 Install this countertop cost estimator on your website and capture the contact information of potential customers. See Demo. 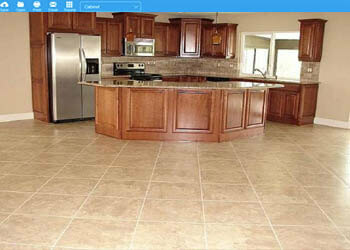 Floor covering visualizer, if you sell tile, carpet, vinyl, laminate or hardwood flooring. Turn site visitors to customers. See Demo. Remodeling Kitchen And Bath Have Never Been So Fun And Easy. How would you like to keep your site visitors longer on your site to make more sales? The amazing kitchen visualizer you see below is designed to do just that. For a small fee, we will install the kitchen visualizer (and all other ones you see on this site) on your own website. 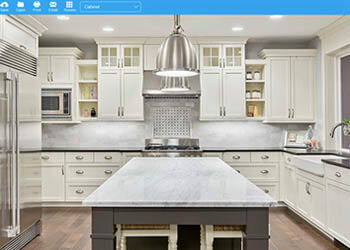 If you are looking for an affordable website tool to get more traffic to your website and convert site visitors to customers, then you should contact us today to see how easy it is to get this nice kitchen design visualizer installed on your website today! There are 100s of homeowners in your town that are looking for kitchen design & contractors every day. Now imagine they find your website and start working with your kitchen visualizer choosing their kitchen cabinet doors style, finishes, granite & quartz countertops, tile & wood flooring, wall paint and more. They are going to be so interested that it gets them to you for an estimate! We offer three simple payment plans to get this kitchen visualizer on your own website. No contract and you can cancel anytime. We accept paypal as well as credit cards. Call or contact us for more information today. Do you need a professional looking and responsive website for your home remodeling business? We will design you a complete website at an affordable price. 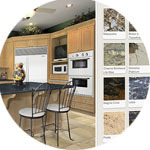 All of the home remodeling visualizers presented here can be installed right on your website. Let your site visitors release their inner designer with these cool designer tools to design their kitchen, bath, cabinets, countertops, and flooring. We can handle all your website marketing needs for a low monthly fee. Our marketing plan includes Social Media marketing. 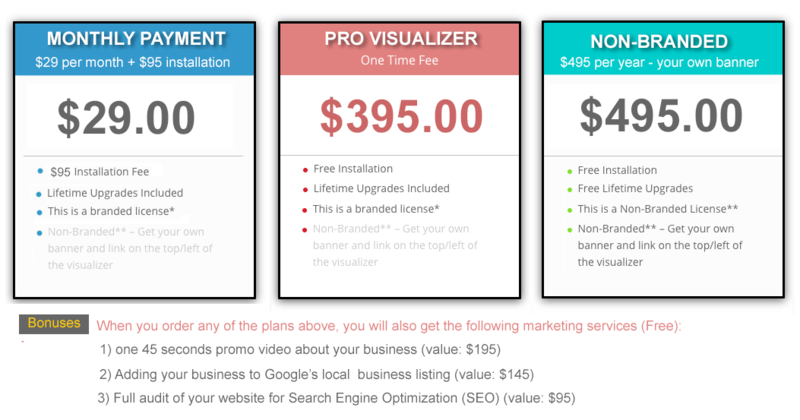 We will put your website on the 1st page of Google or you won’t pay us! 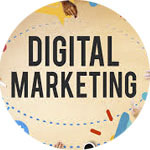 KBF Designer is your one-stop source for all your website design and digital marketing needs. Since 2000, we have helped 100s of home remodeling contractors with affordable website design and digital marketing. Give us a call today for a free on-site or phone consultation. Learn how to engage your site visitors and improve sales! Get latest news on Visualizers and much more. Unsubscribe at anytime. kbfdesigner.com - All Rights Reserved.